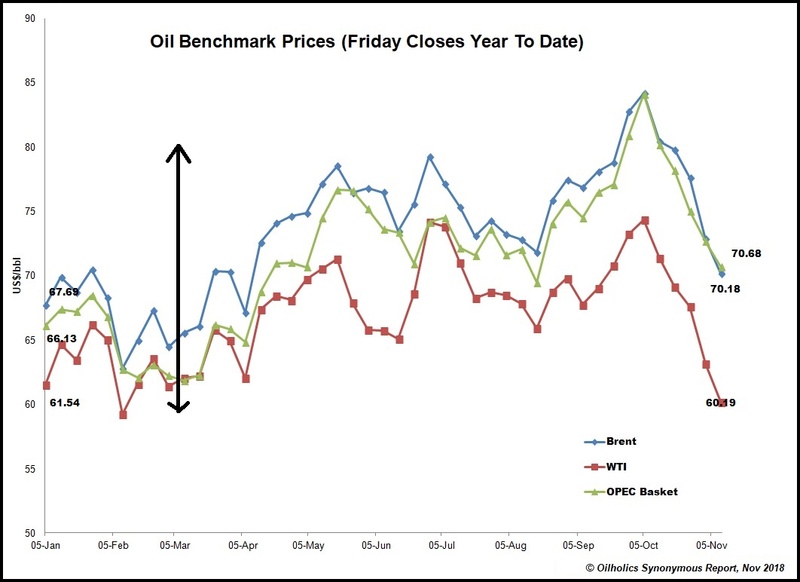 Over the last 12 months we've heard of oil price spikes and slumps, ups and downs, four-year highs and six-week losing streaks, and exaggerated predictions of $100 per barrel crude prices, being made by those prone to making them and then getting them spectacularly wrong. Yet, as the Oilholic hears Saudi Oil Minister Khalid Al-Falih [suggest a 2019 OPEC production cut might be on the horizon] on TV while sitting in a hotel room in Altanta stateside, the inescapable fact is that Brent, WTI and OPEC's own basket price of crude oil(s) exported by its members remains as range-bound as ever (see graph, click to enlarge). 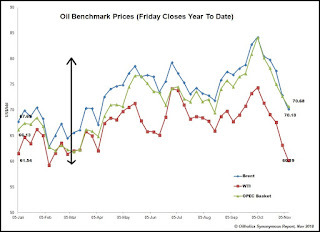 Whichever way you look at it - all year the price has fluctuated within a $60-80 per barrel range. You can come up with all sorts of fancy, creative explanations about it, as both the bulls and bears have, but the market is where it is because the physical traders are at peace with the supply demand and dynamic as it stands. While speculators and money managers, especially hedge funds, might pile into the market at the slightest sign of an uptick in the hope of extending the rally, physical traders (at least the ones the Oilholic is in contact with in Amsterdam and Shanghai) aren't exactly sweating while looking at their solver models that point to no scarcity of supply. Given that dynamic, paper market panics don't last long as recent weeks and months have proven. End result - everyone from Morgan Stanley to RBC Capital Markets, and all the so-called price prophets in between, are scrambling to downgrade their oil price forecasts. Some have even gone to the other extreme predicting $40 per barrel oil prices, and that won't happen either. Using an aggregate of global demand growth from various data sources (OPEC, EIA, IEA) and squaring it against global supply (as it stands) - the oil price will likely remain range-bound in the $60-80 bracket. So keep calm and carry on! That's all for the moment folks. The Oilholic needs to head out and brave the rain in Altanta, more from here later. Crude froth goes before a fall?